Every business nowadays must be represented online – it has become a market standard. The internet is a global marketplace for any sphere of professional activity, and a huge number of purchases, orders and deals are made online every day. You can ignore phones, mails, and other communication channels, but it is impossible to run a company without a website. Moreover, the value of the website has been growing from year to year. The online market is constantly evolving. The ability to access the internet from mobile phones and tablets has caused a real shift in the evolution of ecommerce, and nowadays we are online everywhere, regardless of our location and activities. Each service and enterprise, even the smallest local firm, for example, a beauty salon or café must have a site, not to mention large enterprises and international business sharks. And that’s that. 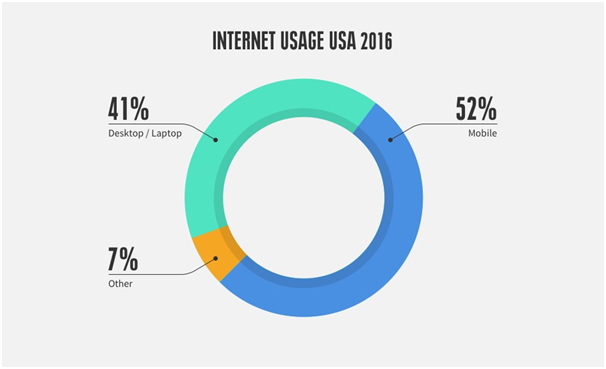 Over the last few years the part of all mobile internet users has grown to 50%, and the mobile traffic share continues to grow. 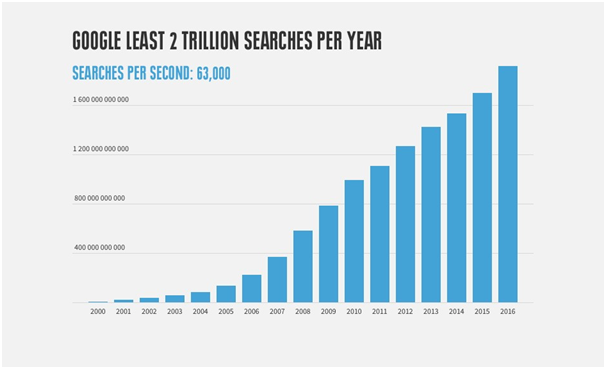 Each second Google receives about 63,000 search queries. In 2016 there were more than 2 trillion search queries run through this search engine. 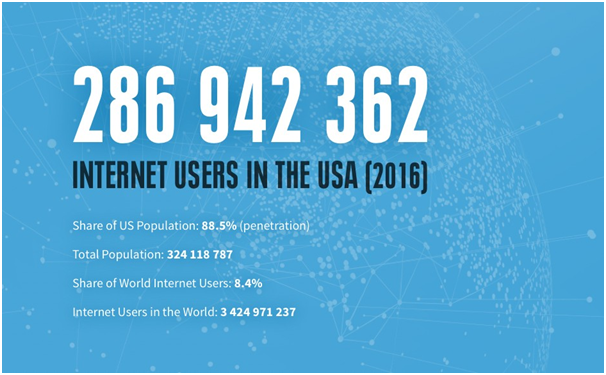 In the USA there are 286 million online users, 4 of 5 US citizens actively use the internet. What is a company website created for? The original purpose of professional site development may vary. But if you decide to make a web design for your agency or service, you need to have a clear vision of what results you want to get out of it. And of course, you have to define the time frame for achieving your business goals by means of the online promotion. Many companies engage in web design just because it is a must, and the see they need to have a face on the internet. Following this approach, more likely you will get a certain number of new customers or simply get nothing. It is because a businessman has no idea how powerful it can be in terms of attracting target audience and converting this traffic into real profit. Another popular reason for website development and design is creating and supporting a commercial image. In some spheres of business this is the principal goal that should be considered. Our website design company in Philadelphia receives a lot of orders purely with image in mind. Usually these are eye-catching, fashionable sites, and beauty here is much more important than features and technological perfection. Most often a company site is created to promote business services and products. Modern business owners are aimed at increasing sales, getting more customers, an expanding their marketing outlets. Specialists at Direct Line Development enjoy identifying these goals, because they allow us the ability to demonstrate the power of the internet and the professional value our website design company adds! There are many less common verticles seeking to achieve more specific goals through their web presence. For instance, an offshore business website may be aimed at attracting international investments, or a recruiting agency aimed at hunting qualified specialists for numerous job positions. Certain companies must publish their information about their services for the public to view in accordance with the law. All these special cases require specific attention, non-standard solutions and a highly competent team of web professionals. Let’s focus on three major reasons why sites are created and analyze how such websites must ‘look and feel’. 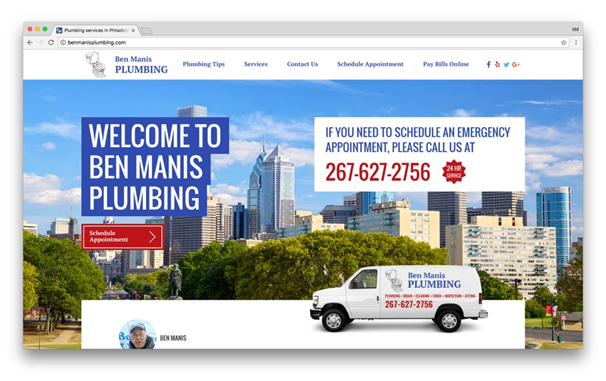 Ben Manis Plumbing clearly displays the advantages of its services to both existing and prospect clients. This business provides solutions to vital problems and makes life much easier for every customer. See how easily you can schedule appointments for various purposes, business or private ones. 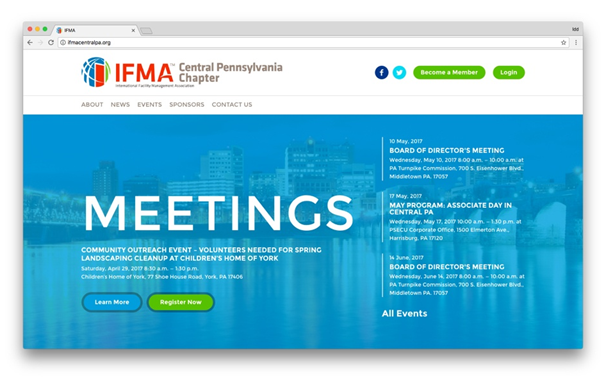 The IFMA website offers a handy solution of setting up meetings. 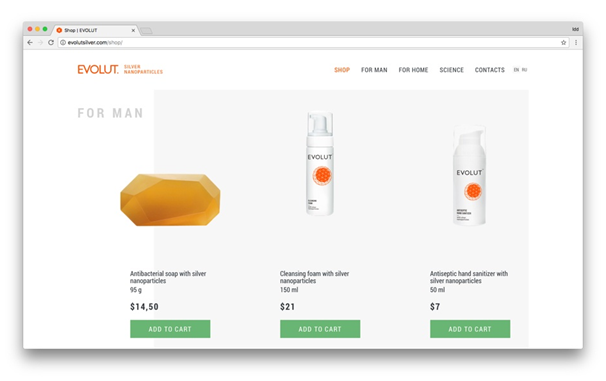 Evolut is a scientific ecommerce service for customers with different interests. 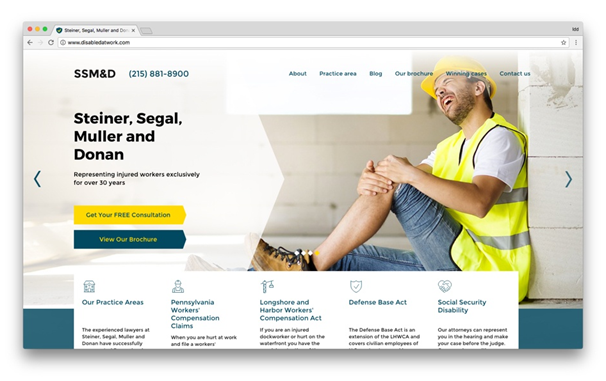 The website for Steiner, Segal, Muller and Donan law firm represents legal services in a clear and attractive manner. A professional website for presenting a company has to inform the target audience about its success in the chosen area, demonstrate strong qualifications and provide simple answers to customer’s questions. The vision of the company must coincide with the vision of its clients, and the site is the best way to demonstrate this perfect match. 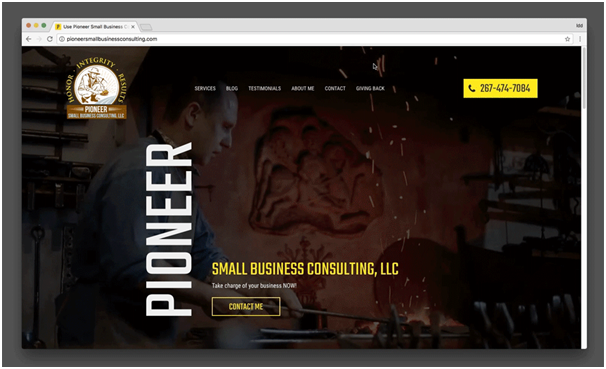 So, what makes a good business website? First and foremost, a company’s website has to inform the visitor what types of services or products it provides, and how successful the company has been in this area. It must reflect what brands it represents (it can be a multi-brand enterprise). That’s why a custom corporate web design is of utmost importance. Clarity in the mission, purposes, and values of each brand is vital. It is necessary to list the areas of operation, the locations of company representative offices, as well as the company history and plans for development. The more transparent the provided information is, the closer your business is to its customers. It is worth addressing the difference between you and your major competitors, demonstrating unique attitude and attentiveness to what you are doing. Image-building company sites are different from informational presentations. What makes a good website of this kind? Some types of business’ require only focusing on aesthetics, and visual perception of its customers. These websites can have minimum of text content, while bristling with photos, animated user interactions and other visual tricks. However, regardless of content type, it also has to represent the company values, its commercial potential and attitude to clients. It is important to demonstrate the contribution to solving real human problems or fulfilling people’s needs. Each page must be well-thought and styled smoothly, as if it is a photographer’s portfolio, fashion catalog or an art gallery. Your website hopes to stand out within your industry, if it is built smartly. Such websites must sink into the mind of customers, and when they think about your service, your company will be the first one they remember and go to. It is highly important to build a strong, lasting impression by an image-building site. Of course, it requires involving professional designers, developers, marketing and PR specialists, highly experienced content creators to create an appealing responsive website. It is not only about commercial activities. Very often image-building sites are ordered by various non-profit organizations, media services or public event organizers. Visual content is a powerful tool to demonstrate moral values, express the social manifesto or grab the world’s attention to some global problem. These websites should be perfectly displayed on any devices. That is why responsive layouts with adaptive graphics are a must. The first impression from seeing this site is vital for the future success. A corporate website works 24/7 to increase profits. It never stops in gaining new customers, conducting sales, boosting your business value by all possible means. Compared to a real employee, it must possess the full range of required tools and qualification for fulfilling its job successfully. If you have hired an insurance consultant who is completely unaware of what insurance is, what kinds of insurance exist and what plan should be recommended to a customer in each specific case, don’t expect much from his activity. But if your consultant is a real pro in what he is doing, be sure he will bring you lots of satisfied clients. A professional website is just the same! A worthy site for increasing sales must contain detailed information about your goods or services, show their characteristics and strongest advantages and appeal to potential customers. It must be easy and comfortable to use, as the satisfaction from any purchase highly depends on the customer comfort. This easiness is gained by means of technology and thoughtful implementation of actions the customer performs on the website. A site visitor should not experience any difficulties in viewing your catalog, adding products to a cart, paying directly online by a convenient method, or build a list of ‘favorites’, etc. Simplicity is the key. Besides an attractive and handy interface and detailed products description, a company website will benefit from testimonials from real customers. This is a true proof of your product value and full compliance with the promoted features. It helps to build trust between business and customers better than any paid advertisements. Statistically about a half of online users rely on customer reviews when deciding to make a purchase. What makes a good ecommerce website? 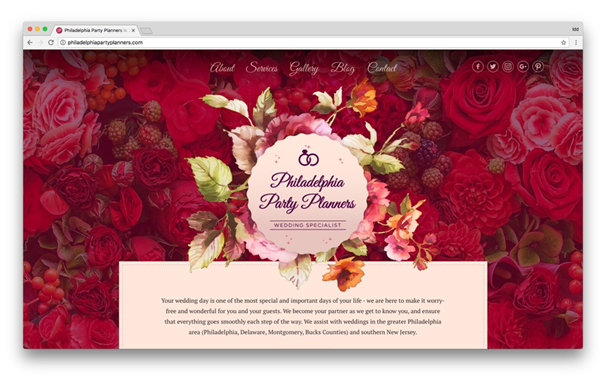 We, an experienced website design company from Philadelphia, will give you some free tips. Functionality, a choice of payment options, real product reviews and other ‘tricks’ for boosting conversions must be implemented into an ecommerce website. And your site needs to be a step ahead of competitors in technological performance. This is no less important than the quality and applicability of the product itself, and sometimes even more important from the marketing point of view. You can create the most informative and good looking business website in the world, perfectly displaying the value of your services and supporting your commercial image. However, it is all useless until anyone actually visits the site. Any website starts bringing results and receiving traffic – when people visit it and use it for interacting with your agency, shop or another business. Traffic consists of your existing and potential customers. The more traffic your site gets the more online sales you will get. So, how to make an effective website? How to attract visitors? The most affordable way to drive more traffic to a site is SEO – adapting your website to appear in the top search results in Google for certain queries. SEO covers much more techniques, and there are highly experienced SEO professionals in our website design company in Philadelphia. Our website design company pays much attention to optimizing websites in the development stage, as well as through post-production SEO maintenance. Today’s search engine mechanisms become more ‘humanized’ – they rely on behavior factor and organic user interests. That is why interesting content and full correspondence to the user search request is a must for high positions in search results. What you can cut costs on? –Additional features. Yes, everyone likes it, but your firm’s site will comfortably exist without optional add-ons right after the launch. 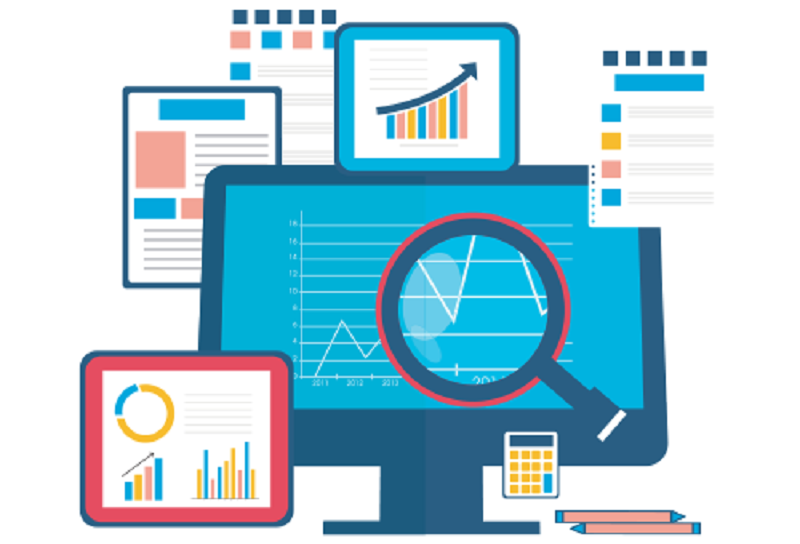 You can improve your website capabilities over time, once you get the reaction of real online visitors, analyze their needs and see what is missing on the website. Of course, it’s an additional attraction, when the site dresses into topical colors for holidays and other occasions important for your industry or country of operation. It also makes sense to setup a newsletter for clients, ability to schedule meetings or calls, have the live chat for technical support, etc. However, our website design company recommend launching the website with a responsive layout and the basic set of features and then develop its capabilities in response to real customer needs. Our website design company suggests developing big websites with a comprehensive set of features only if a client has prior experience with websites and knows for sure everything about his customer needs. –The size of the website. For instance, you own some fitness center that offers hundreds of various training programs. You don’t need to dedicate a separate page to each program. At the beginning just group them and make a separate page for each group. If a company is trying to launch a large-scale website all at once, especially having no experience, they risk to be stuck for years, adding new features and pages here and there. All things considered, the sooner customers start using your website the better, and you can develop further, launching improvements on the over time. It is also better for SEO, as Google likes websites that continuously grow and become handier for users. – Paying for the brand. Сompanies that have been operating on the market for a long time prefer to pay top dollar for the ‘best’. Often these expenses make no sense. It is more about reputation. – Photo session. What makes a good web design is good photos. You’ll see lots of websites with low-quality photos, and it affects the general impression about the site and business it represents. The same is with the stock photos – they are not personalized enough to appeal to customers. By using stock photos you risking using the same images as your competitors – this is a terrible practice. Spend money on a professional photo session for website content. You will be able to use your unique HQ photos in all of your promo campaigns forever. – The platform your site is based on. A site based on Wix or WordPress is suitable for a small firm or a startup project, and just at the beginning. While your business grows, it will be necessary to move to custom web development. You will need to start from scratch, delete all previously created pages. It will cost you additional time and money. – Don’t save money on developers and designers. If you were offered a custom web design with a yearly SEO plan at only $1000, you should decline such offer at once! No professional developer is capable of creating a worthy solution for this amount, because the amount of required human resources, knowledge and expertise cost much more. Finally: what makes a website good? A site for business requires a professional approach in development to become an effective marketing tool on the internet. It must look attractive, work quickly and correctly and be useful for your target users. However, outsourcing the site creation to professional developers doesn’t mean that success is guaranteed. Without defining the clear goals you will not achieve desired results. Setup your goals before diving into web design and pass your vision to the hands of specialists. SEO is a must to increase site popularity online, boost sales and fight competitors. Having stable traffic to your site will allow you to convert this traffic in any way that benefits your business. These are the major rules that make truly effective website and guarantee success after launching a business site and will put you in position to squeeze the best return out of your investment. How to Become an Influencer in Your Industry With Focused Content Marketing?